Baltic amber rosary in olive shape 10x14mm size. Tested in salt water - not sink; tested in Uv light - glow white; tested in acetone-not harm surface. 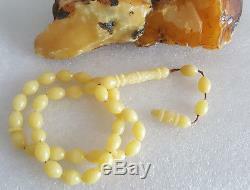 Lengh: 47cm (without imam head) Head imam 60x10mm Only amber rosary, no decoration on photos. Made of natural baltic amber by pressing it. Its pure natural baltic amber without any chemicals. The item "Carved natural baltic amber rosary royal white olive amber prayer" is in sale since Wednesday, August 29, 2018. This item is in the category "Jewelry & Watches\Loose Diamonds & Gemstones\Loose Gemstones\Amber". The seller is "daxas18" and is located in Vilnius, Vilnius.